Pure African Mango Supports weight loss and maintenance of a healthy weight when used alongside a healthy diet and exercise programme. Supports healthy cholesterol and blood glucose levels and so therefore useful in type 2 diabetes. Irvingia Gabonensis is latin for what is commonly referred to as African Mango. The extract from the Irvingia Gabonensis seed is a soulable fiber that has been shown in double blind randomized studies to be an effective weight loss agent. In fact, Irvingia Gabonensis is fast becoming one of the most popular weight loss supplements. Irvingia Gabonensis is a tree found in West and Central Africa also known by the natives as the wild mango or bush mango. The tree is valued for its dika nuts in addition to producing a yellow edible fruit. Irvingia is high in fat, similar to other nuts and seeds, and contain an extraordinary 14% fibre content. Irvingia has been prized for its healing properties. 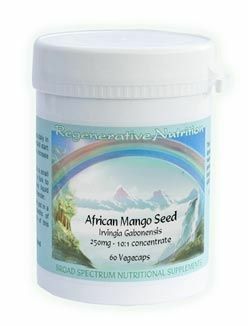 Regenerative Nutrition provides the strongest and best value African Mango supplement on the market. It is manufactured in the UK to the highest quality to provide the best value. Children 6-12 Years: 1 capsule daily. Best taken 30-60 minutes before food with a glass of water. Irvingia is a genus of African and Southeast Asian trees in the family Irvingiaceae, sometimes known by the common names wild mango, African mango, or bush mango. 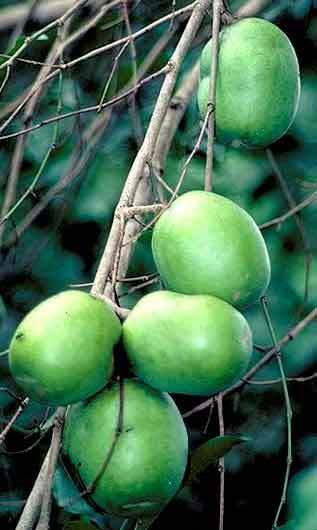 They bear edible mango-like fruits, and are especially valued for their fat- and protein-rich nuts. The subtly aromatic nuts are typically dried in the sun for preservation, and are sold whole or in powder form. They may be ground to a paste known variously as dika bread or Gabon chocolate. The nuts may also be pressed for vegetable oil. The extracts from the Irvingia Gabonensis seed have been shown in double blind randomized studies to be an effective weight loss agent. In fact, Irvingia Gabonensis is fast becoming one of the most popular weight loss ingredients available today. Irvingia Gabonensis has played an important role in the nutrition, economy and traditional medicine in western and southwestern tropical Africa from Nigeria to Angola. Through the help of the United Nations, a number of scientists have been made available to enhance the production and commercial use of Irvingia. The first official studies conducted on Irvingia's benefits as a weight loss aid were not completed until just a few years ago after researchers and scientists started realizing the possible benefits of this African tree. Since then, numerous studies have shown Irvingia to aid in weight loss, improve total cholesterol, LDL cholesterol and blood glucose levels. This is a natural product that is made from the seeds of the African Mango. This fruit and its seeds have been used for centuries as a way for the people of Africa to curb their hunger while they traveled long distances. It not only is an amazing appetite suppressant, but it also helps to provide energy at the same time, which can only enhance your diet. We put on weight because if all the food we eat is not used up to ‘fuel' our daily energy requirements, it is stored as fat. The body does this by converting the food starches into fat for storage. What African mango extract does is inhibit this conversion process so that less of the food we eat is converted to fat and instead is passed harmlessly out of the body. The high souble fiber content acts as a bulk forming laxitave which acts as an appetite suppressant. Appetite suppression is further enhanced by sensitizing the hormone ‘leptin'. What this means is that the signal sent to the brain telling us we are full up is boosted, even if we haven't eaten that much. It is known that chronically overweight people have a resistance to leptin meaning that the signal telling them they are full up is not as strong so they think they are still hungry. African mango extract also causes increased production of the hormone ‘adiponcetin'. This has the effect of increasing fat and glucose metabolization with obvious weight loss results. Again, it is interesting to note that chronically overweight people have a deficiency of adiponcetin as opposed to a resistance as with leptin. Various studies have confirmed the benefits of Irvingia Gabonensis. Early indications show Irvingia Gabonensis can produce significant weight loss with clinical results showing 28.1 pounds of weight loss (vs. the 1.5 lbs lost in the placebo group). Interestingly, Irivingia users showed body fat decrease by 6.3%. Researchers point to Irvingia's ability to produce these amazing weight loss results from the favorable changes to PPAR gamma, leptin, adiponectin or glycerol-3 phosphate dehydrogenase. The soluble fiber found in the Irvingia seed also works as a bulk-forming laxative which also works to suppress appetites. Above is describes how african mango extract brings about weight loss, but that's only half the story. Other health benefits have also been confirmed. By binding to the bile acids, it works to lower bad (LDL) cholesterol levels, and raise good (HDL) cholesterol levels Also, by delaying stomach emptying, blood sugar levels are reduced after eating. Yet more benefits have been recorded, although it should be stressed that these are anecdotal as opposed to clinical like those previously mentioned. African mango extract has been taken for hundreds of years in its native Western Cameroon, not only as a food stuff, but also for its medicinal properties and for its energy boosting/ fatigue fighting properties. Irvingia Gabonensis is now being promoted as a weight loss supplement. So many people are purchasing these supplements just for that purpose. However, they might be getting much more than that. Studies carried out in 2005 and again in 2008 appear to show that Irvingia does not only assist you to slim down but also has numerous health advantages. Irvingia might also be an all natural strategy to attack microbial and fungal infections. Studies demonstrate that using Irvingia Gabonensis reduces serum cholesterol while raising the High-density lipoprotein cholesterol. It has additionally been proven to lower systolic bloodstream pressure. To put it simply, it means that this supplement can help you live healthier. In a study, a test showed that using Irvingia confirmed decrease in plasma blood sugar levels. This may be crucial news for individuals struggling with diabetic issues as getting all these nutritional supplements or some type of this dietary supplement might be soon accustomed to treat diabetes. Individuals currently taking diabetes medicine and thinking about using this supplement should talk to their healthcare provider because the mixture of this supplement and recommended medicines could decrease your excess blood sugar levels. Although the fruit of the African Mango is very nutritious, it is actually the seeds that are ground up and made into an extract for weight loss products. Referred to as "Dika nuts” by locals in Cameroon African, they have been used for centuries by tribesmen on long hunting trips to ward off hunger. Initially, researchers believed that and the antioxidents were believed to be mostly responsible for the weight losses that were noted in testing. But further studies, in particular one performed in 2009, proved the benefits were far too great to be from these reasons alone. They found that Irvingia Gabonensis has a natural ability to act as a very strong appetite suppressant, actually influencing the way your brain works. Also, Irvingia Gabonensis increases the body's production of Adiponectin, which improves sensitivity to insulin so the body will burn more fat. Leptin is a naturally occurring hormone in the body that helps us control our appetites; basically, it signals to the brain that your body has enough and you don't need to eat any more. However, most obese people have built up a resistance to Leptin in part due to high levels of C-reactive protein (CPR). CPR can bind to Leptin, lessening its effectiveness. In addition, Irvingia Gabonensis lowers the levels of CPR in the body, allowing Leptin to accomplish its job of reducing the appetite. It is also believed to increase the body's production of Adiponectin, which increases individual cells' sensitivity to insulin. Scientific research on fat cells suggests that irvingia has alpha-amylase-inhibiting properties which can help support a slowing of the rate of carbohydrate absorption from the intestines and a reduction of the caloric impact of starchy and sugary foods. Adiponectin is a hormone involved in helping to maintain insulin sensitivity on the membranes of energy-producing cells. Big fat cells produce less adiponectin, and overweight people need to be especially concerned about maintaining healthy levels of adiponectin to support insulin sensitivity and metabolic fitness. Scientific data suggests that irvingia helps support healthy adiponectin levels. Irvingia Gabonensis extract has been shown to help support leptin sensitivity in overweight people. In a recently published study, Irvingia demonstrated beneficial effects upon leptin blood levels, followed by weight loss and inches off the waistline. In addition to supporting healthy leptin sensitivity, irvingia has demonstrated the ability to reduce the activity of glycerol-3-phosphate dehydrogenase. Glycerol-3-phosphate dehydrogenase is an enzyme involved in the complex biochemical process that converts ingested starch and sugar calories to stored body fat. Irvingia has been shown in studies involving fat cells to reduce the activity of glycerol-3-phosphate dehydrogenase, which may help reduce the impact of starch and sugar calories on body fat.